The Wall Street Journal published this article featuring the AUDL's NY Empire and MLU's NY Rumble. Back in 2012, Izzy and Chris Mazur played on the same AUDL team – the Connecticut Constitution. "No one's making a living off Frisbee yet," Mr. Isaiah Bryant said, over coffee recently near the Midtown office where the 29-year-old Columbia University graduate works a day job as an ad salesman. What may come as a surprise to many sports fans is that people are even trying. 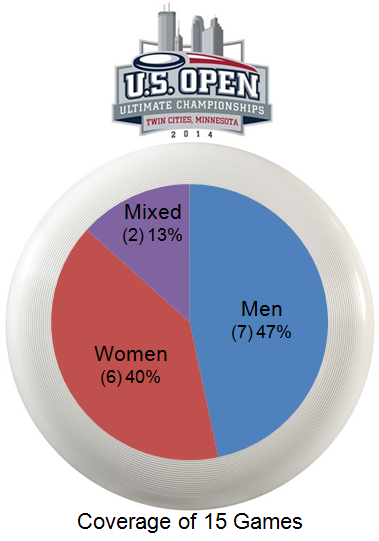 Interest has grown across the country in ultimate Frisbee, the laid-back sport long popular in college intramural leagues, which involves two teams trying to advance the disc down a field to a goal zone. For two seasons, New York has had not one, but two, teams playing in rival pro leagues. Like most pro athletes, Mssrs. Bryant and Mazur said they train and study game video most days of the week. They just have to do it around their day jobs, since players, as a rule, earn such paltry paychecks. Players, most in their 20s, have to pony up for most of their gym memberships. To the average observer, their professional matches could easily be mistaken for pickup games among particularly athletic young men, albeit in slightly spiffier game attire. On a recent Saturday, the Empire faced off against the Montreal Royal, in front of a crowd of less than 300—including many family and friends. Mr. Bryant was active on the sidelines, advising his teammates and giving them plenty of back slaps and high-fives. But even the most devoted Frisbee fans question the viability of these teams. Average game attendance hovers well under 1,000 people, with ticket prices around $10. And New York City has no shortage of sports teams to follow. With their 37-12 loss on Saturday versus San Jose, the Salt Lake Lions became the first American Ultimate Disc League team to go winless in the regular season. There has never been a pro Ultimate team that lost all their games. Never. The Lions end their inaugural AUDL season with a -207 point differential, which averages to nearly 15 point losses per game (14.78). Salt Lake is in a very tough AUDL West Division with the likes of San Francisco, San Jose, Seattle and Vancouver -- all perennial Ultimate hotbeds. Detroit Mechanix (0-12), from the Midwest Division, are on pace to join Salt Lake in this dubious distinction. The Washington D.C. Current hosted the Boston Whitecaps on Saturday night for the 2014 Major League Ultimate Eastern Conference Championships. Nearly 800 people attended this one-game playoff to decide which team would represent the East in the MLU Championships. DC took an early lead to start the game; 2-0. Boston eventually took the lead and led throughout the game until the 4th quarter. Just like in week 2, the game came down to the final seconds AND on its final play. Instead of a shot to the endzone versus Boston as in week 2, the Current looked to stop them from the endzone. This time, the Current were on defense, and prevented the Whitecaps from tying the score. DC won 18-17 -- the same exact score when DC upset Boston in week 2. Read the game summary [DC Current]. Hey, were there 4 refs on the field to begin the game, and then 5 refs by the second half? Did anyone else see the fireworks in the last 2 minutes of the game? DC's version of celebrating with champagne in the locker room was eating dessert on the field in the form of decorated cupcakes & cake. 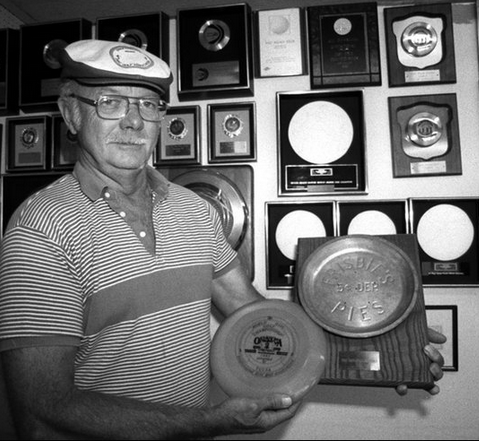 Today, June 28th, is the birthday of the man - "Steady" Ed Headrick - credited for designing the modern Frisbee; he would have been 90. Headrick, while working for WHAM-O, submitted the flying saucer patent in 1965, and redesigned it for enhanced flight stability ("Lines of Headrick"). He was a self-proclaimed Frisbyterian. There's also a memorial museum in his name for his amazing career in the disc golf arena. The 40-game schedule for 2014 Major League Ultimate teams ended last weekend. 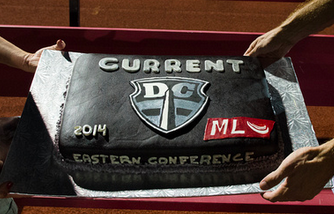 Each MLU team played 10 regular season games within their Conference in 2014. The 2014 league average for total goals per game was just over 38 points (38.025). The Eastern Conference averaged nearly 39 (38.8) combined goals per game, and the Western Conference averaged over 37 (37.25) combined goals per game. 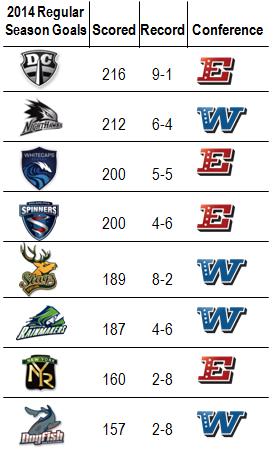 As expected, the 4 teams at the top of the rankings are in the MLU playoffs. Based on combined rankings within defense + offense during the 2014 regular season. 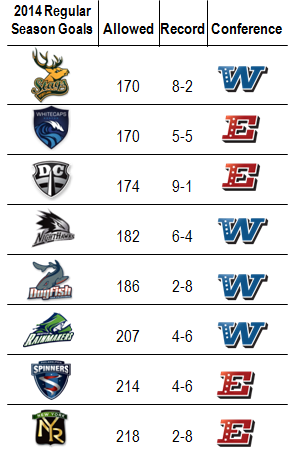 MLU playoffs start on Saturday, June 28 with the Eastern & Western Conference Championship games. The winner earns a bid to theMLU Championship Game on July 19 at PPL Park. 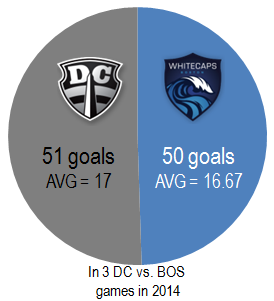 Saturday, June 28 @ 7pm ET: Boston Whitecaps (5-5) and DC Current (9-1) played each other 3 times during the season with Current winning 2 games, including Boston's first loss in the MLU and Boston's first loss at home. Current are 5-0 at home; Whitecaps are 1-4 away. Boston is the only team to beat DC in 2014 - the Current's only road loss on April 26. The last time Boston played a game in DC was April 19. This 2014 ECC is a re-match of the 2013 Eastern Conference Championship. 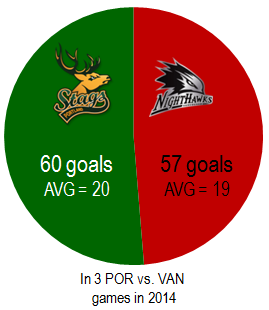 Saturday, June 28 @ 7pm PT: Of the 3 games between Vancouver Nighthawks (6-4) and Portland Stags (8-2), the Stags won 2 games. Stags are 4-1 at home, while Nighthawks are 3-2 away. The last time Vancouver played a game at Portland was the first game of the 2014 season, on April 12. The 2014 Major League Ultimate regular season ended last weekend. The outcomes in the Eastern Conference were similar to 2013 with Boston and DC earning playoff spots, except this year DC goes in as the #1 seed. The Western Conference was completely reversed with the 2013 basement dwellers - Portland and Vancouver - making the playoffs. 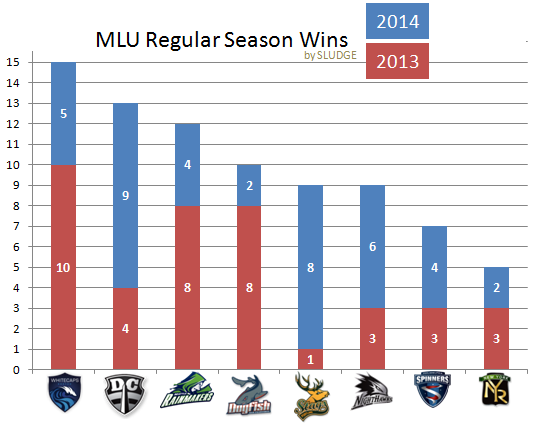 Each MLU team played 10 games during the regular season. Portland posted the highest net increase of wins with 7 more wins than last year; 2014 (8-2) vs 2013 (1-9). 700% = % increase in Portland's wins in 2014 (8), compared to 2013 (1). 3 out the 4 playoff teams from 2013 (Seattle, Boston, San Francisco) did not post a winning record in 2014. 75% of teams (Portland, DC, Vancouver) with a positive change in wins made the 2014 playoffs. 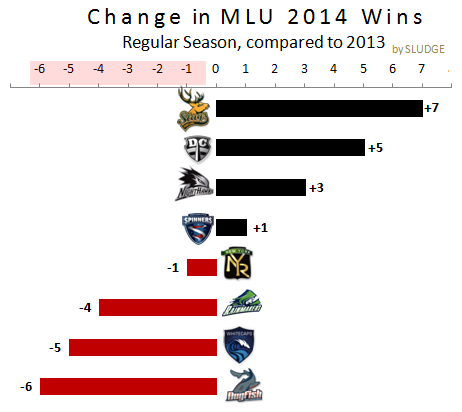 Boston added to their lead in overall MLU wins, leading with 15 total regular season wins. 9 = DC's wins in 2014 = combined wins in 2 seasons (2013 + 2014) by Portland, by Vancouver. 5 = Boston's wins in 2014 = New York Rumble's combined wins in 2 seasons (2013 + 2014). San Francisco Dogfish's record = (2-8) in 2014; (8-2) in 2013. Vancouver Nighthawks doubled their 2013 wins (3) 2014 to 6 in 2014. DC Current more than doubled their 2013 wins (4) to 9 in 2014. Both Boston and Seattle halved their 2013 win total in 2014; though, Boston still made the playoffs. Fifteen games of the 2014 "season's first major Triple Crown Tour event" are scheduled to be broadcast over July 3-6. NexGen will be providing early coverage - buy access for $15 - of club ultimate games in Blaine, Minnesota, and then ESPN3 for the later games. With the conclusion of MLU's 2014 regular season, there remains 2 playoffs games to determine which teams play in the MLU Championship. Both games are scheduled for Saturday, June 28th, which are hosted by the #1 seeds in each Conference. Vancouver Nighthawks @ Portland Stags at Lincoln H.S. in Portland, OR. Tickets = $12. Boston Whitecaps @ Washington DC Current at Catholic University in Washington, DC. Tickets = $8. Based on a comparison of all Major League Ultimate teams, Portland and DC sold the least expensive season tickets in 2014. The Stags extended their single game ticket pricing of $12, while the Current slashed their pricing from $14 to $8 for their playoff game. 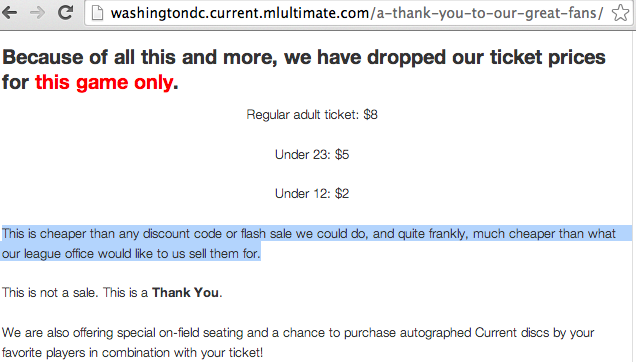 DC's GM explains: "This is cheaper than any discount code or flash sale we could do, and quite frankly, much cheaper than what our league office would like to us sell them for." With World Cup fever running high, it's an excellent reminder that another worldly sporting event is taking place in August -- Worlds 2014. Football (Futbol) is referred to as "The Beautiful Game" while Ultimate was named because of it being "...the ultimate game." 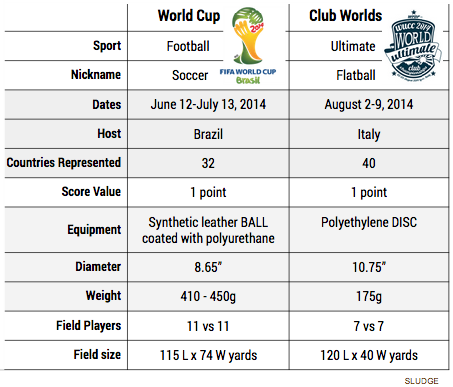 NOTES: FIFA's recommended field size. Adidas makes the official Brazuca ball. The Ultrastar by Discraft is the official WUCC disc. 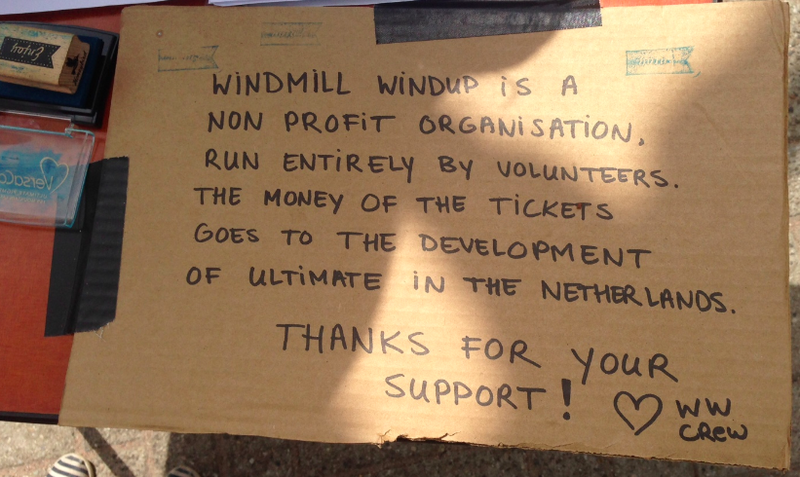 Whilst in Amsterdam last weekend, I had the amazing opportunity to experience "The Ultimate Frisbee Festival" in Amsterdam -- Windmill Windup. This well-organized, fun tournament hosted nearly 90 Ultimate teams. I arrived to the Nationaal Rugby Centrum via Citybus 21to check out the final games on Sunday, June 16th. WW tokens for food, drinks and gear. The next 3 photos capture the halftime event of fans trying to throw their disc into the bicycle that Herbie (the elephant) rides from one endzone to the other. their disc into the bicycle's basket. Fans rush the Ultimate field littered with thrown discs. Out of ~400 thrown discs, only 1 disc hit its target (in the basket)! 1500+ fans fill the stadium and surround the field for the finals. Nice use of Ulti gear by the Get Horizontal film crew. P-lease! Nice chart explaining the wastewater recovery. Primary: Powder blue jersey with wave/B logo in the center of the chest. Numbers on the left breast and sleeve are dark with white stroke and are nicely legible. I've written about the logo design elsewhere, but I'll say again that the whitecap looks more like a feather than a wave. Alternate: Clean whites with "BOSTON" above the collarbone near the top seam. Dark blue numbers with a bright blue stroke outline on the center of the chest and on the sleeve. Shield logo on the left breast is too small to make out any details. Knocked out white type would be better, and inverting the black and white of the wave would also make it more legible. Primary: "NYR" logo with brass knuckles coming out of the Y to make it look like a bouquet of flowers is centered on the chest. The logo is gold with a white stroke around it. If not for the stroke the logo would be completely eaten up by the contrast against the green shirt. Alternate: The word "RUMBLE" in a soft-cornered san serif runs all the way across the chest in black on the white jersey. The awkward "NYR" badge is relegated to the sleeve and this jersey is the better for it. Gold numbers with a green stroke on the left breast are nicely sized and colored. Primary: Royal blue jersey with a white sash, the full Spinners logo/crest on the left chest. The player number is placed so that half of the number is on the white and the other half descends below, into the blue field. Simple and balanced, but if you weren't familiar with the teams it would take quite a while to figure out which team this is. Alternate: The Spinners chose the Puma design with a sash of color running across the chest; the Puma logo and the player number are on either side of this sash, with the Spinners' spinning vortex "S" graphic in the center. The gradients in this graphic render it muddy from anywhere but very close range. Primary: Portland also chose the jersey style with the contrasting sash across the chest. The "Stags" logotype is placed in the middle of this sash, with a small part of the logo breaking the sash and crossing over into the green field. This feels sloppy and forced. Alternate: Small Stag logo and logotype on the left-side of chest is still legible because of the effective design of the mark. Large sponsor logo beneath has the entire jersey feeling like there is no point of emphasis - all the elements have the same visual weight so there is no movement or contrast in the design. 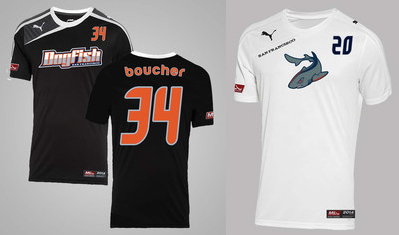 Primary: Same placement of player number and Puma logo, with large "Dogfish" logotype across the chest. The slab letter and two outlining strokes make this a bit hard to read. Alternate: Large Dogfish logo (without type) in the center of the jersey with Puma logo and player number up high on left and right. Font choice for the numbers is definitely the boldest choice of any team. Primary: More balanced than the alt jersey. The icon logo is used and holds up well at a smaller size. 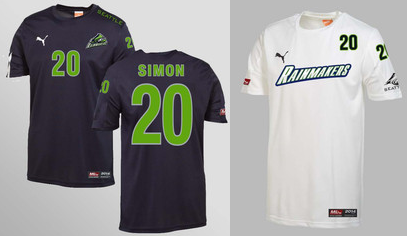 Alternate: "Rainmakers" is a long word to stretch across the chest of this jersey - they do it and keep it legible. 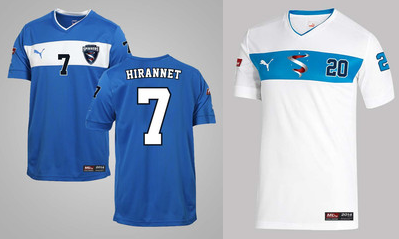 The position of the player number and Puma logo do not correspond and make the whole thing feel lopsided and off-kilter. It also seems a little off that the numbers are filled but the letters are knocked out to white. Primary: The hand-drawn "NightHawks" logotype is just too dainty to look good across the chest of this jersey. At least the italic numbers match the slant of the type. Alternate: Angry bird logo is centered in a black field with a black interior. The lines are dynamic and full of energy but are too small to be viewed well from a distance. 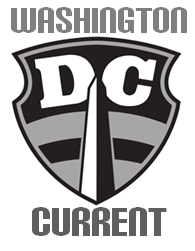 Primary: The oddly anthropomorphic DC crest is very legible at the size it is placed on the left chest. Silver ink for the numbers is a nice touch. Just above the numbers, the 3 stars and 2 bars (a nod to DC's flag) is fitting. Alternate: Gray/silver type on an all-white jersey, with a sponsor graphic at the same scale as the team name leaves this jersey looking like a shirt you'd get for signing up for a corporate challenge fun run. 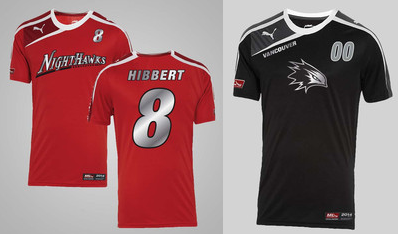 Purchase MLU replica jerseys at the MLU Online Store. The idea of a jersey critique has been tossed around ever since the 2013 season of logo reviews, so SLUDGE is thrilled to welcome Eli Neugeboren (@enoogs) for his take on the 2014 pro Ultimate jerseys. In most professional sports leagues there are very strict rules in place regarding uniform design. These rules are in place to create a cohesive and unified look and feel from team to team. Creative Review recently posted an article outlining how stringent the requirements are for designing a kit for the world cup, highlighting how each pre-approved element on the kit must be within certain height and width parameters, and placed in specific relation to other elements. Ultimate Frisbee has, historically, been played in a tee-shirt and shorts. The shorts may be long, or they may be short, the tee shirts might be form-fitting or they might be baggy. Sometimes the shirt is tucked in and, more often than not, it is left to flow freely around the waist of the players. Some folks, both male and female, favor playing in a skirt, and some folks like to rock a tank top, but there is not, generally, too much variation on the theme of tees and shorts. For the last fifteen years or so there have been a number of home-grown clothing brands making ultimate gear - made by and for ultimate players - from Gaia, to VC Ultimate (now VCS Ultimate), to Five, and a number of other grassroots brands taking a chance at building a business on this game. The AUDL has partnered with VC Ultimate, and the MLU with Puma, to create the official 2014 uniforms for professional ultimate frisbee. 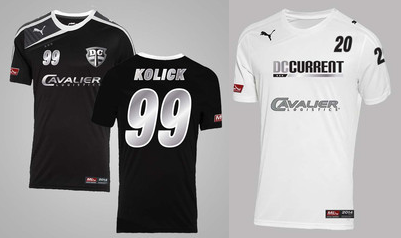 The VC designs take advantage of using dye-sublimation to create dynamic full-jersey designs, while the MLU have been giving what the official press-release called "exclusive" jersey designs, but with a cursory search are revealed to be soccer shirts favored by rec leagues and high school teams. 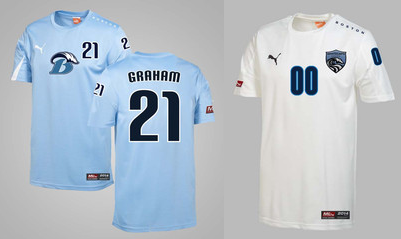 The MLU also seems to want their uniforms to look more like EPL kits, with tiny team badges. 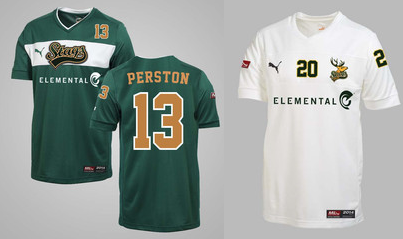 The MLU designs definitely look more cohesive from team to team, but the shirts themselves look like what they are - cheaper jerseys for a rec league team. 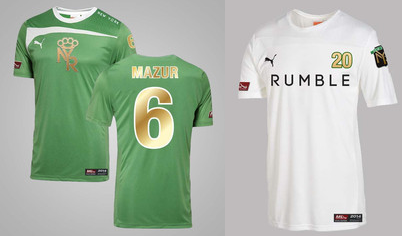 I think it is excellent that the league has partnered with a major international clothier, but the shirts they ended up with feel like throwaways for this company, and not a serious commitment on the part of Puma to develop gear for the sport. VC, on the other hand, has only ever developed gear for this sport, and over the past decade-plus, have developed their gear in an uncomplicated way to focus on comfort for the wearer, and dynamic designs for the viewer. The sublimation technology allows them to print a design covering the entire jersey and shorts in a way that no other professional team is adorned. The problem with this approach is that there is no cohesion from team to team other than the cut of the shirt and shorts. 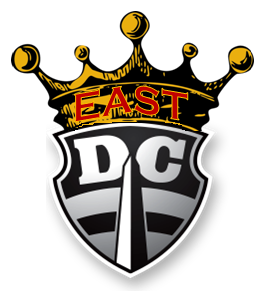 Though last year's home game had playoff implications, the 2014 Washington DC Current now earned hosting rights of the Eastern Conference Championship game. This will be the Current's second consecutive appearance in the Eastern playoffs of Major League Ultimate, and a rematch of 2013. Thirty years ago, this T-shirt promoted Ultimate. 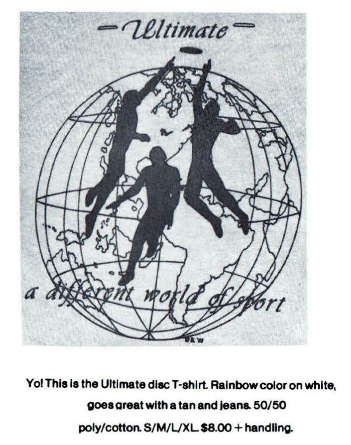 Advertising of a t-shirt design "Ultimate a different world of sport." The ad copy: "Yo! This is the Ultimate disc T-shirt. Rainbow color on white, goes great with a tan and jeans. 50/50 poly/cotton. S/M/L/XL $8.00 + handling"
USA Ultimate posted these charts earlier this year giving a nice visual for where their membership resides. 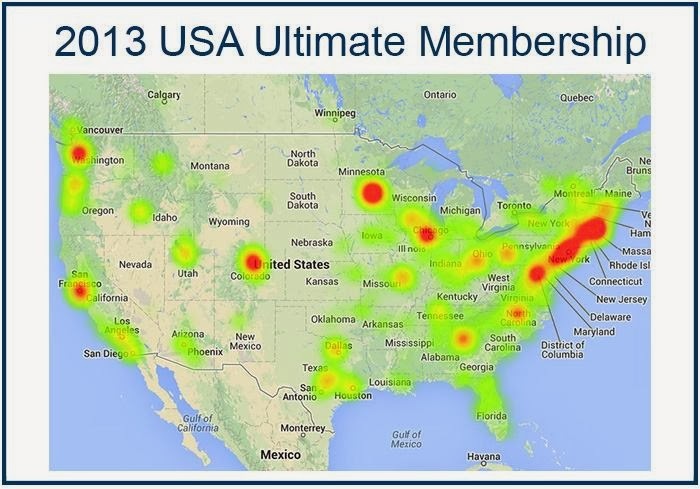 The areas with most members appear to be in/around Seattle, San Fran, Boulder, Minneapolis, Chicago, Boston, New York, Philadelphia, Baltimore and Washington, D.C. As expected, these area represent hotbeds for both college Ultimate programs and club Ultimate teams. 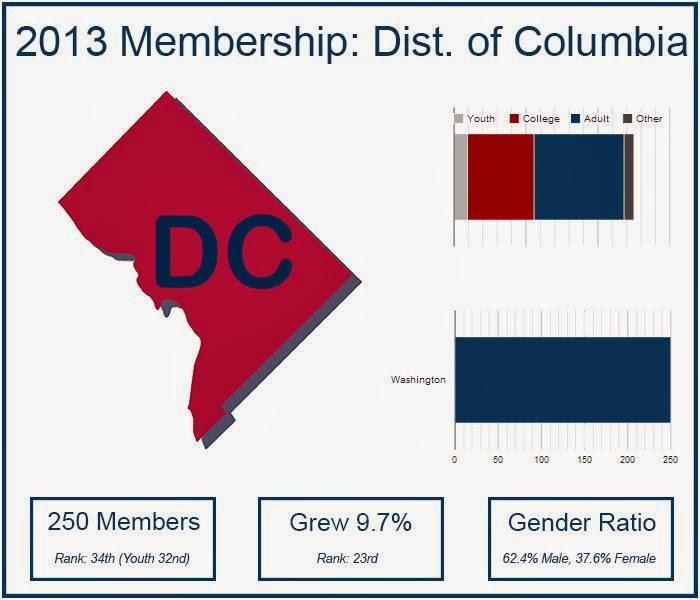 The DC-metro area is a glowing bundle of USA Ultimate members — 250 in DC, 247 in Arlington, VA, and ~193 in Montgomery County (MD). 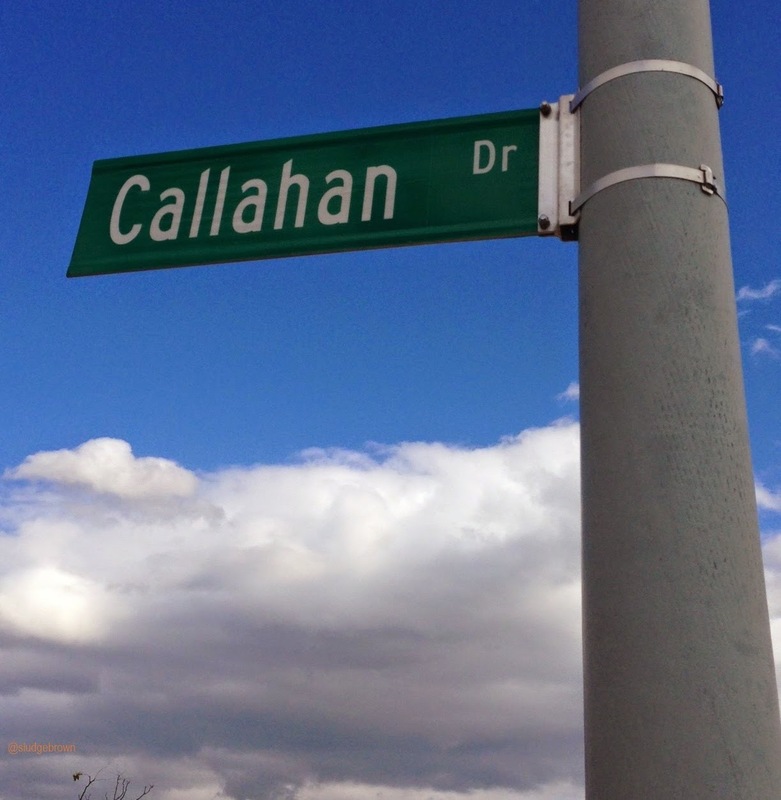 Congratulations are in order when Ultimate players find themselves here. 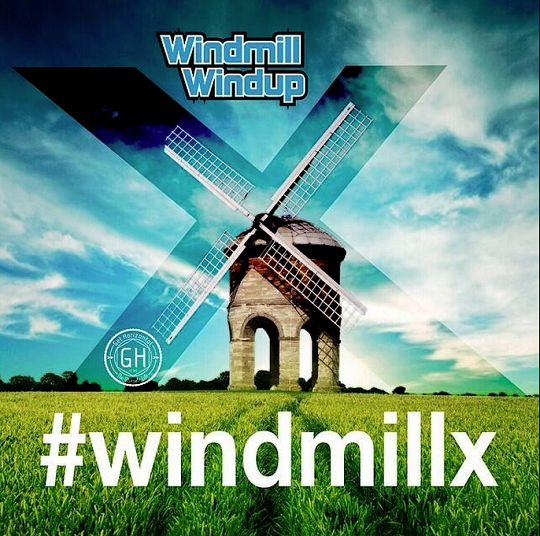 Windmill Windup 2014 starts today and run through Sunday (June 15). This year marks the 10th year of this Ultimate Frisbee festival in Amsterdam, Netherlands. Congrats to Herbie for reaching this milestone! There are a total of 88 teams (40 open , 30 mixed, 18 women), almost entirely from Europe, competing in this tournament. Nifty 50 is the lone team from the United States. Their roster draws from players throughout the U.S. and gather to play at great Ultimate tourneys. To attend the Sunday finals, a ticket costs € 7.50 (~$10 USD). Additionally, Windmill plans to be even more sustainable via a wastewater recovery effort. Via their blog: The 'FosVaatje' is a new installation built to recover phosphorus from wastewater sludge. It is done so in the form of 'struvite' (magnesium ammonium phosphate), which can be then directly used as fertilizer. With urine, recovery from 'pure form' makes even more sense, as 50% of all P comes from pee (geddit?). Just one month away until the 2014 Pro-Elite Challenge (Chesapeake Invite) in Leesburg, Virginia. 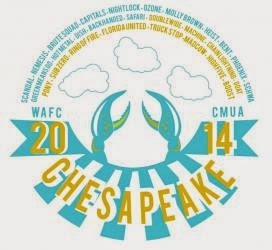 This USAU Triple Crown Tour event will feature 12 Men and 16 Women's club ultimate teams on July 12-13. If you weren't invited, or just unable to attend, NGN offers a streaming package ($15). The oft-crooked front line of the endzone was held down by a 20-lb dumbbell. End zone ends outside the green carpeted field area. Also, there is not a line for the sideline closest to the teams. SIGN: "Beware of Flying Objects Leaving the Field"
A rare sighting of Tyler Degirolamo sans gloves. 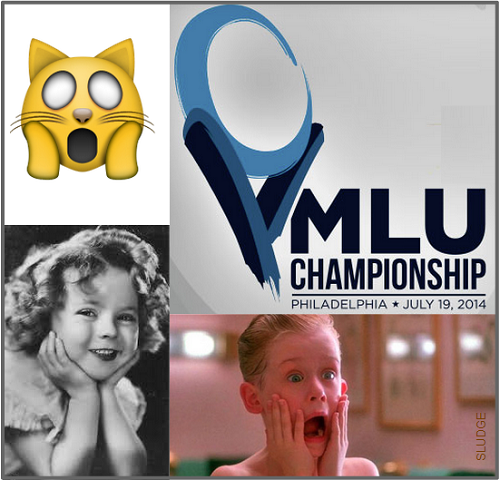 The 2014 MLU Championships to be hosted at PPL Park is less than 40 days away. 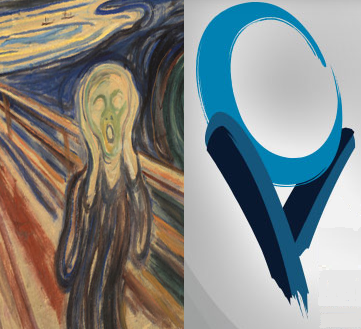 Taking inspiration from the 2014 World Cup facepalm meme, the Enso-esque MLU Champs trophy logo resembles a famous pose – Edvard Munch's The Scream. Now that that's out there, here's more of what you can't un-see!!! 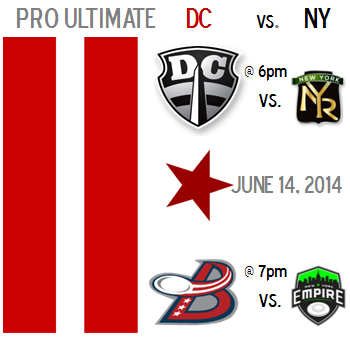 The good news is both DC-based pro Ultimate teams have home games on Saturday, June 14! 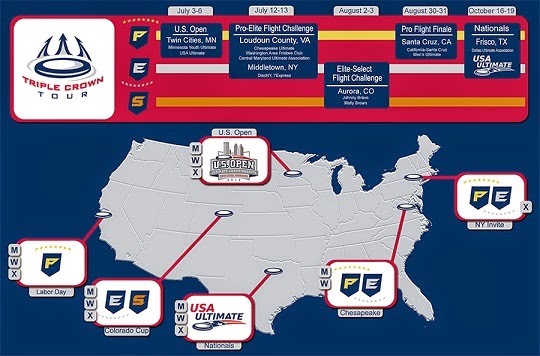 The bad news is, unlike in May when fans could attend both games, fans must choose which pro Ultimate to attend. The unfortunate scheduling conflict has both Saturday games starting around the same time (Current at 6pm; Breeze at 7pm). Both DC teams play against their respective league's opponent from New York City. 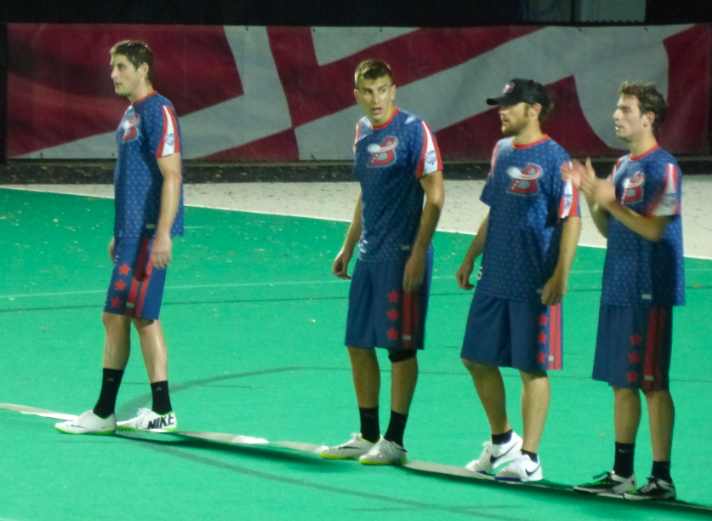 At 6pm, the MLU game: D.C. Current (7-1) play New York Rumble (2-6) at Catholic U. Tix. One hour later (at 7pm) and ~6 miles away, the AUDL game: D.C. Breeze (6-2) play New York Empire (7-1) in College Park. Tix. Last month's doubleheader versus Philadelphia was swept by DC. Will DC sweep again?